Where do you see yourself with your nearest and dearest this festive season? Fine dining served in an award-winning restaurant, wintry walks through one of England’s finest counties or sat in front of a roaring log fire with mulled wine and homemade mince pies? Fortunately, at our country house hotel in Gloucestershire, we are able to offer all this and so much more for your Yuletide jubilations…. During your stay at our luxury hotel in the Cotswolds, take a picturesque ramble through a walker’s paradise, Warden’s Way. You do not need to embark on the full fourteen-mile stretch of unspoilt countryside; take a two-mile meander down to the idyllic village of Bourton-on-the-Water for a taste of rural countryside life. If your stamina permits, then proceed to the charming twin villages of Upper and Lower Slaughter and finally wind up in the village of Winchcombe. This is a great activity for history or nature enthusiasts, but also for those looking to get some fresh air during a splendid Christmas in the Cotswolds. We are considered as one of the finest dog-friendly Cotswolds hotels so we are in the perfect location for long dog walks! If you are looking for a wide range of handmade gifts or for general present inspiration you will be spoilt for choice. The area has an incredible selection of Christmas markets, from the German Christmas Market on Cheltenham’s Promenade to Gloucester’s Craft Market. A luxurious Christmas in the Cotswolds would not be complete without a visit to the Blenheim Palace. During the winter months, a spectacular display of lights embellishes the resplendent Estate. Take the winding path around the scented fire garden, venture into the glittering ancient woodland and wander around the Great Lake, taking in the glow of the brilliantly lit boats. To complete your journey around the spectacularly regal grounds, enjoy some homemade festive fare, take a ride on the vintage carousel and browse the gift shops. For the literature lovers amongst us a visit to the quintessentially British village of Stow-on-the-Wold is a necessity. Take a walk down the Dickensian style streets, admire the rustic butterscotch buildings, revel in the quirky shops and welcoming pubs – this is a charming location that will truly get you into the festive spirit. Once you have had your fill of Christmas cheer, turn your weary feet in the direction of our luxury hotel in Gloucestershire. Our unrivalled dining options are beautifully presented, using local and seasonal produce – some ingredients have come from our very own garden. 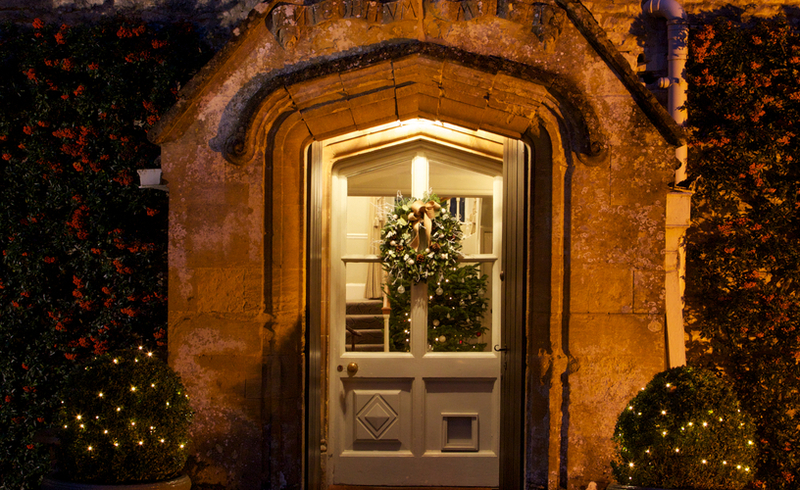 Come nightfall, your sumptuous and exquisitely decorated room awaits you to complete your Christmas in the Cotswolds. If you would like to spend the festive season at Lords this year, we have availability left for December however our Christmas package is now fully booked but we do have a waiting list. Please contact us directly to be put on the waiting list. To stay before Christmas and build your festive cheer, book direct here for best rates, or contact us here for any queries. We hope to see you soon!